Back in the long-lost days of mid-2009 (OK, four years back…) a contest called “Build Something” was held over on the excellent Lead Adventure Forum, with the contest theme of “Transportation”. 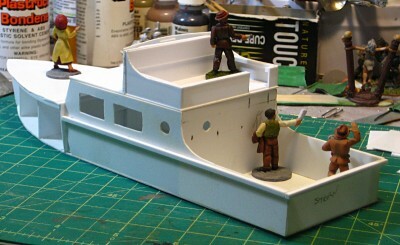 I decided to build a small motor yacht/large powerboat sort of boat for pulp gaming, taking inspiration from and got as far as cutting the base of the hull, the cabin walls and the sides of the stern out of styrene plastic before inspiration fled and I moved on to other projects. The now-lost original plan, from October 2009. Click for larger. Lots of other projects, in the intervening years, but I never actually threw out the barely-started boat, it just gathered dust and got used as an impromptu container for scrap wood and other bits. Late last week I finally got around to cleaning up my long-neglected hobby bench, didn’t feel like painting, and decided to dust off the motor yacht instead of starting an entirely new project. I still have a large amount of styrene plastic (plastic card) hanging around, so it was still the material of choice for this project. 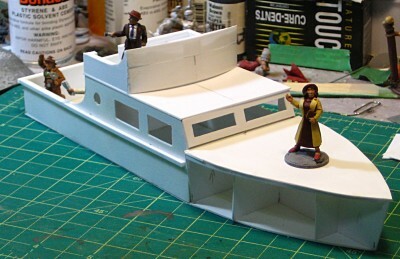 I’ve added frames to the bow and a deck, then added a removable roof to the cabin and a flying bridge on top of that. The boat restarted, October 2013. Click for larger. The hull sides will be the next big step. I’m planning on doing each side with a single long strip of styrene, and then use putty up at the bow to properly form the actual point of the bow. After that there’s still a lot of detail work and cleanup to do. Door and window frames, a ladder up to the flying bridge, and a lot of putty to smooth things out and hide seams. From the stern quarter. Scale provided by 28mm Pulp Figures reporters. Click for larger. This last photo shows the curves in the aft end of the boat quite nicely. 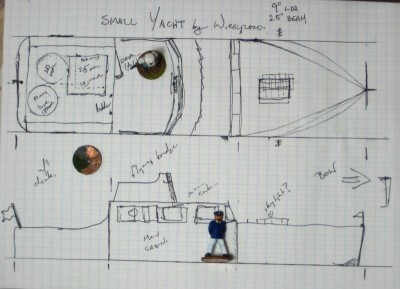 I’m going to use steel wire for railings on the sides and back of the flying bridge, and might put a removable canopy over the rear deck. Also need to come up with a name, to be painted across the stern in large gold letters! First, on a quick administrative note, the Warbard was offline for part of last week due to an attempted attack on the WordPress installation that runs this site. I was able to work with the my webspace providers and get everything sorted and up and running, I’ve made some behinds-the-scenes changes and tweaks, and hopefully that will be the first and last time I have to worry about crap like that! No content was lost and we’re fully back up and running, at least! On a happier note, I’ve been very gradually upgrading our pencil-marked handwritten Pulp Alley League sheets to spiffy-looking word processor documents. This also gives me the ability to share them more widely, of course, so here’s the Dread Thuggee stranglers for Pulp Alley (PDF, 80Kb) for everyone’s enjoyment. Adding Thuggee stranglers to a pulp universe is obvious enough, and was actually something I started thinking about in relation to the pulp-horror game Strange Aeons. There was a thread I started over on Lead Adventure, to which several people contributed excellent links, both to miniatures suitable for India and other related resources. The Thuggee figures are from Pulp Figures. The first of mine appeared way back in LPL5, a more recent batch appeared in LPL7, and I still have a few left to paint to round out the cult and add some variety. In Pulp Alley, the stranglers re-use and re-brand the useful and flexible Animal skill to show their lack of firepower and dedication to strangling and other brawling skills. The Stealthy Agents perk lets the whole League skulk in the shadows more effectively, but does mean it’s a small League at merely four stranglers. They’re good at what they do, though, and have had a fair bit of success in our games, especially in tight terrain or limited visibility where they can really put their melee skills to use! As a followup to last week’s posting of four of our Pulp Alley Leagues, here’s the blank PDF version of the roster I created. Pulp Alley is of course © Pulp Alley; this roster sheet is my own work but anyone can print or modify it for personal use. Enjoy! There’s a very nice blank roster in the Pulp Alley rulebook, but being able to type one out and print copies as needed is also useful! Although things have been quiet on this blog (too quiet…) we have been gaming fairly regularly! In fact, this long weekend is the first weekend in quite a while I haven’t gotten a game in. It’s been a Canadian Thanksgiving long weekend filled with museum visits, bike rides and food instead, which is just fine. Anyway, most of what we’ve been playing has been Pulp Alley, a fast and elegant set of pulp skirmish rules. Teams in PA are called “Leagues”, and we’ve created six or eight that appear regularly. Rather than have one person always playing the same League, we’ve got a “pool” of Leagues that we all take turns playing as the mood strikes us. I created most of the Leagues when I first bought the rules, although most of those early Leagues have been rebuilt and tweaked at least once since then, as our understanding of the rules improved! I’ve done up a few of our Leagues as proper PDF files thanks to LibreOffice, and I’m putting them up here for inspiration or to use as-is in your own Pulp Alley games. All four of these files are free to print or reproduce for personal use only. First off, Sir Charles, Aristocratic Investigator (PDF, 81Kb). He may or may not be secretly doing the bidding of His Majesty’s Government in London, but this wealthy, well-connected character, his staff and hangers-on have the habit of turning up in some remarkable places. Second, Count-General Vladimir Drunkovich and his White Russian Exiles (PDF, 80Kb). Being on the losing side of the Russian Civil War meant exile from Mother Russia and has made these ruthless, dangerous characters even more desperate and daring. No-one is sure anymore if Drunkovich is still fighting for Russia or if he’s gone entirely mercenary… and only a suicidal fool would ask the Count that sort of question directly. If he didn’t kill you himself, the deadly Natalya would skewer you! Third, the scarred, ruthless and mysterious villain known as “Stahlmaske” or “the Teutonic Schemer” (PDF, 80Kb). A veteran of the brutal trenches of the Great War, Stahlmaske and his flunkies bring ruthless violence wherever they go… but Stahlmaske is nearly as deadly to his followers as his enemies! Note that the Shadow is built from the “Weird Abilities” in the first Pulp Alley supplement, Perilous Island; the first three Leagues need only the main Pulp Alley book to use! Far too quiet around here lately, a post a month or so for far too long! I do apologize; I’m still gaming regularly but my painting has dwindled to a terrible ZERO figures finished since May of this year and since I finished the buildings in August I’ve done no scenery work, either! I’m going to get the painting desk dusted off and back in production fairly soon; I’d hoped for this weekend but real life and work got in the way. I’ve also got a pile of small and medium-sized partially-finished scenery projects to complete, so I might re-start the whole process by clearing some of them up. In the meantime, here’s a pair of links, both map related! Someone in Hungary has digitized a huge collection of 1910 Austro-Hungarian maps of Central Europe in 1:200,000 scale. It covers the entire Austro-Hungarian Empire and nearby portions of neighbouring states, so the whole thing covers from Istanbul in the lower right up to southern/central Germany (around Cologne) in the top left. The quality of the scans is very good, and the relevance for World War One or Russian Civil War gamers should be obvious! In a pulpier vein, via the always-awesome Propnomicon, this 1885 map of Chinatown in San Fransisco. I’ve linked to both Propnomicon and the David Rumsey Historical Map Collection websites before, but they’re both well worth exploring!